The Trickster is totes in to Halloween. I have no idea where it has come from - well, actually, I do. It has come from all the displays at the shops. But prior to it popping up a few weeks ago he didn't even know what it was and somehow it is now all he talks about. Every day he asks "Is it Halloween today?". He even sat right up the front at kindy story time last week (he usually refuses to sit with the other kids and just hangs at the back) because it was a Halloween book - the awesome Meg and Mog. Because we're going craft crazy right now in lieu of outdoor time thanks to living on a building site, I figured some activities that combined the two would be right up his alley. Voila, Halloween craft. High off the success of kindy story time I thought the same Halloween magic might work at mothers group. So in a bid to get him to interact with the other kids I brought all our crafty stuff in for a Halloween Party. He is actually playing these days and will talk to the adults, but still refuses to talk to the kids! Prior to this he would sit next to me the whole time and occasionally warm up and play right at the end... you know, just as we were leaving. So the Halloween experiment was go! 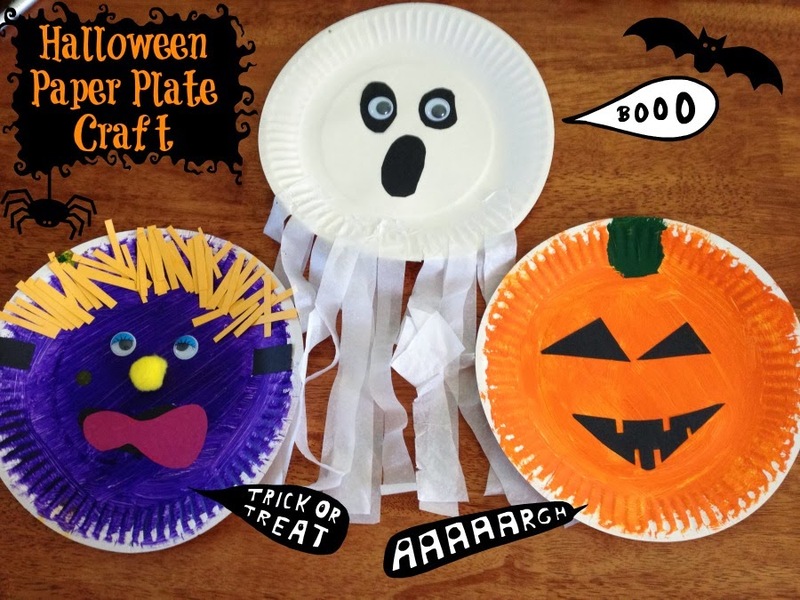 I created three paper plate creatures as examples - a ghost, a jack o lantern and a monster - and since we had a limited time frame (and only one pair of safety scissors) I cut out shapes for mouths and eyes rather than turn it in to a scissors activity. 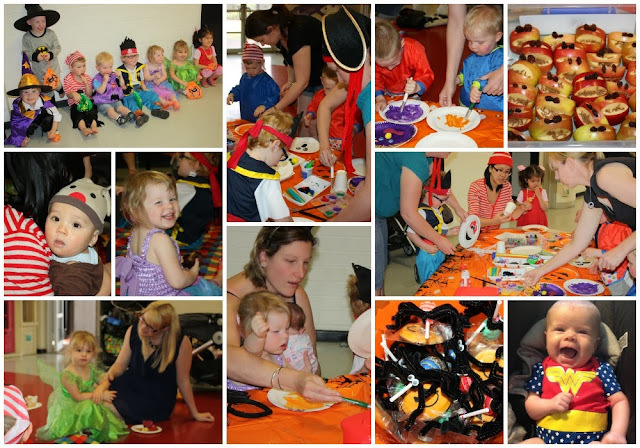 We had multicoloured strips of cardboard for hair, googly eyes of all sizes, pom poms, paint, crayons, markers and pop sticks so all the kids had to do was create whatever they liked and unsurprisingly, most of them created monsters! Monsters are just super cool. The result? A lot of fabulous creations and happy kids... but Tricky didn't participate. He did warm up a bit and play, he spoke to a few of the mums, plus he ate morning tea on the picnic rug with all the other kids and even posed for a group photo - massive leaps and strides for him. But the dude who is coo coo for craft didn't go anywhere near it. But that's OK. Baby steps for my shy guy as we ease him in to part time kindy next year. 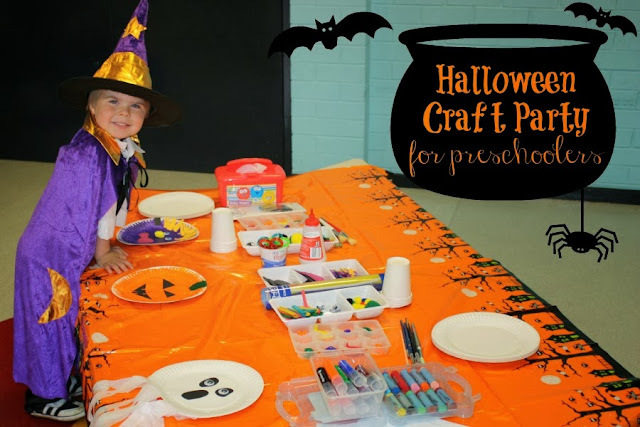 For those wanting to do their own super easy, cheap Halloween craft with toddlers and preschoolers, grab paper plates, paint, markers and crayons, glue and all sorts of materials for decorating such as string, paper, cardboard, googly eyes, gems, pom poms, crepe paper, pipe cleaners - whatever you have in your craft box - and go for it! You can't go wrong with these. The finished product never looks anything like the sample, but that is my favourite bit - seeing how they interpret it and come up with their own unique pieces. We've been making a few of these every day and we'll be stringing them up together and hanging them out the front to let the neighbourhood kids know they can Trick or Treat at our place.